If you're working in some tall condo-office building, you probably get in that little box with familiar faces from day to day. You get crowded inside with them, but only because you've never really met. You stand next to each other and try not to touch anyone. You keep a safe distance. Not talking. There's just silence. Perhaps the only time "talking" happens is when you hear an occasional, "I'm sorry" or "Excuse me" in whispers. No one looks at anyone. The "friendliest" ones would only throw you a quick glance. It's almost as if there's a huge sign that says, "No touching, talking, or looking allowed without the permission from management." 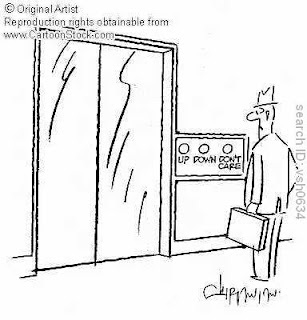 You wonder, sometimes, why people in that little box are careful to only "look" to two directions: up or down. It's either they watch the red number go up in the level indicator, or they stare down at their shoes. People don't face each other, except when they're with some people they already know. Even then, they hush during the short trip. You keep yourself aloof. Anonymous. And assume others will, too. Really, people stand so close, yet, remain worlds apart. Sadly, we (sometimes? or usually?) see the same thing happening inside our homes. Our relationships. Although we don't ride the little box, but sometimes it seems we virtually do. We live so close to each other and yet we don't really "know" one another. We don't touch. Can't stare. Rarely "talk". But we know we want to. Here's great news, we don't have to take the elevator all our lives. Sometimes, walking up the stairs "beside" one another can make all the difference. We don't have to "survive" the little box. We just have to reach out. To connect. To care enough. To touch and be touched. To be stared at. To be missed when you're not around. Because we're humans. We need that. We ought to.